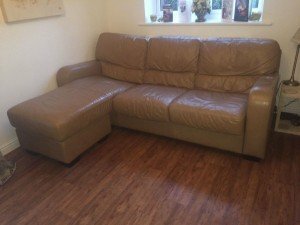 A large four seater high back corner sofa on wood feet, upholstered in camel faux leather. 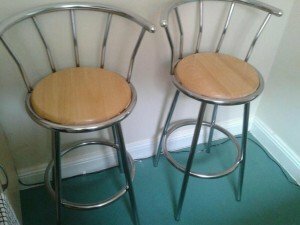 A pair of tall standing curved back chrome bar stools on splayed legs, having a circular wooden seat. 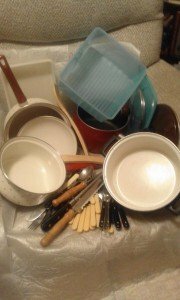 A collection of kitchen accessories, to include four saucepans, containers, utensils, cutlery etc. 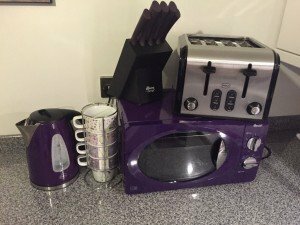 A collection of purple kitchen accessories, to include a four slice toaster, a kettle, a large microwave, a knife set and block and a set of four cups in holder. 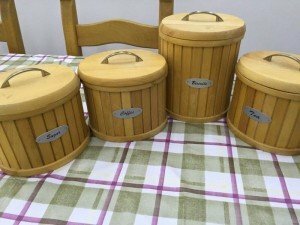 A set of four circular wooden kitchen canisters with stainless steel handles, includes a biscuit barrel and tea, coffee and sugar canisters. 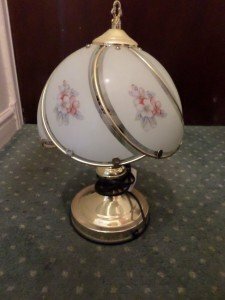 A small vintage brass table lamp and shade, the shade inserted with floral patterned frosted glass panels. 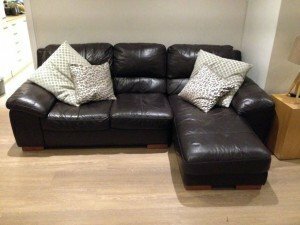 A large four seater corner sofa on solid wood legs, upholstered in black faux leather, together with four throw cushions. 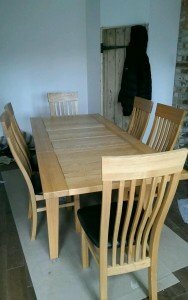 A large solid oak extendable dining table, together with six matching high back dining chairs with black leather seats. 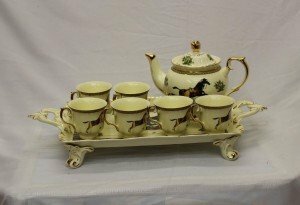 A vintage fine bone China tea service decorated with a horse pattern, includes a large tray, a teapot and six teacups. 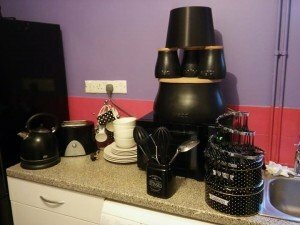 A collection of black kitchen accessories, to include a kettle, a two slice toaster, six polka dot mugs, a microwave, utensils and holder, cake tins etc. 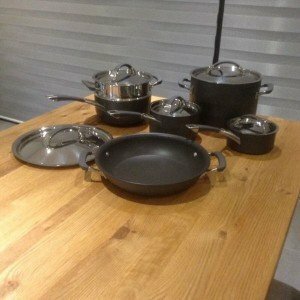 A six piece Kirkland non-stick pan set, includes three lidded saucepans, two lidded soup pans and a lidded wok. 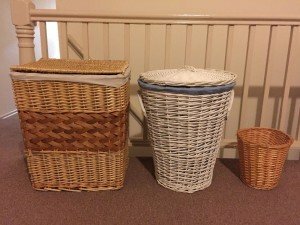 A large cotton lined wicker washing hamper, together with a white cotton line washing hamper and a small wicker rubbish basket. 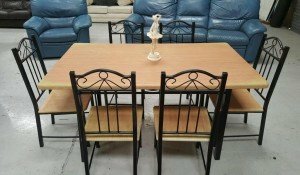 A solid wood and black iron rectangular dining table, together with six matching high back dining chairs. 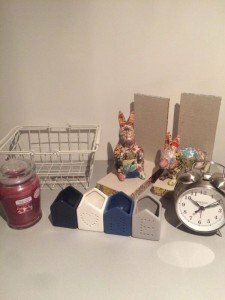 A small collection of home accessories, to include a small alarm clock, a white storage basket, bunny bookends, four small house shaped planters and a large candle. 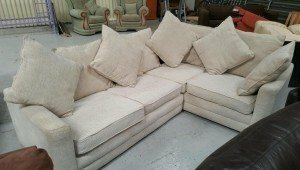 A large four seater low back corner sofa, upholstered in cream cotton with various square backing cushions. 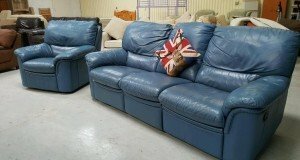 A large three seater high back sofa and matching armchair, upholstered in blue faux leather. 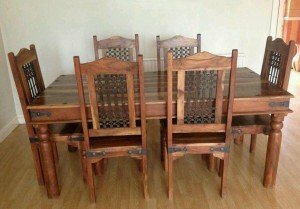 A solid Indian pine large rectangular dining table and six matching dining chairs, inlaid with iron detailing. 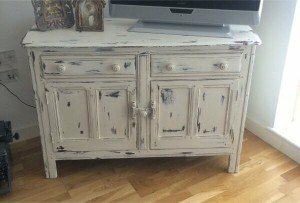 A large hand painted solid wood television unit in the shabby chic style, having two drawers above two cupboards. 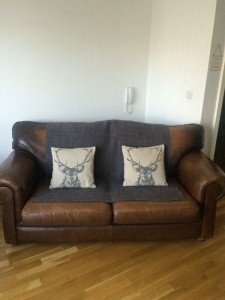 A small two seater high back sofa on wood ball feet, upholstered in brown leather, together with two stag printed cushions and a grey throw. 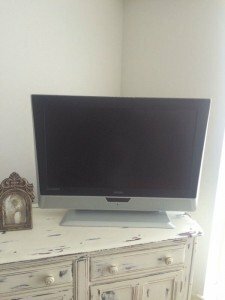 A 32 inch silver surround and black bush television, with built in DVD player.